Two days in Sydney allow you time to thoroughly explore its spectacular harbor—with its iconic opera house and bridge—and the rest of the city center, as well as venture to its world-famous beaches. Here’s how to spend two days in Australia’s most glamorous city. Morning: Check off Sydney’s major sights with a private or group city sightseeing tour. Journey through the streets in a bus or cruise the harbor in a boat to see such landmarks as the Sydney Opera House and the Sydney Harbour Bridge. If you prefer some flexibility, hop-on hop-off bus and boat tours allow you to create your own itinerary. Afternoon: Having gotten the classic views of the bridge and opera house, get a closer look. Guided Sydney Opera House tours offer exclusive access to normally off-limits areas of the building and provide enlightening information about its remarkable architecture. Alternatively, a guided climb up the Sydney Harbour Bridge offers a bird’s-eye view of the harbor below. Night: Better than just visiting the Sydney Opera House is seeing an opera or ballet in the legendary venue. A variety of seating options are available to suit your budget, and special packages often include dinner and a backstage tour. Morning: Get a taste of Australian beach culture by heading for Manly and the Northern Beaches in Sydney’s coastal suburbs. Some longer Sydney sightseeing tours include visits on their itineraries and give you free time to soak up the sun and explore Manly Beach. Afternoon: Only five miles (eight kilometers) from the city center is Bondi Beach, one of Australia’s most renowned beaches. It’s a stop on most hop-on hop-off bus tours, and a visit is often also included on sightseeing bus and boat tours. Night: Conclude your Sydney visit with a sunset harbor cruise. Early evening departures typically cruise by the Sydney Harbour Bridge, Sydney Opera House, and other top sights, with many including dinner and drinks. Sydney Tower offers another dinner option with its revolving restaurant where you can enjoy a meal with 360-degree views of the city. Explore Sydney aboard a hop-on hop-off Sydney Harbour cruise that stops at top destinations including Darling Harbour, Circular Quay, Watsons Bay, Manly and Luna Park. Get a great vantage point for photo ops of icons such as the Sydney Opera House and Sydney Harbour Bridge. Simply jump on and off at as many stops as you like; when you're ready to move on to your next destination, just catch the next boat. Upgrade to include an entrance ticket to Taronga Zoo, another fantastic attraction located on the harbor shores. When in Sydney, don’t miss the chance to watch the Australian Ballet Company light up the stage at the Sydney Opera House. Your Sydney ballet and dinner experience begins with a guided tour of the World Heritage–listed Sydney Opera House, and depending on your choice, is followed by an exquisite three-course meal at either Bennelong Restaurant inside the Sydney Opera House or Portside Sydney. After dinner, watch the ballet of your choice under the sails of the iconic opera house, selecting from options such as Verve, Giselle and Sylvia. Discover Sydney’s history and colonial heritage along with its beaches and natural beauty on a private tour with your choice of half- or full-day tour. The half-day sightseeing tour takes in history along Macquarie Street and The Rocks, lively Kings Cross, the iconic Sydney Opera House, and scenic Watsons Bay, Bondi Beach and the northern coast. The full-day tour upgrade includes a seafood lunch at The Beach Club Collaroy, located on one of Sydney’s stunning Northern Beaches. 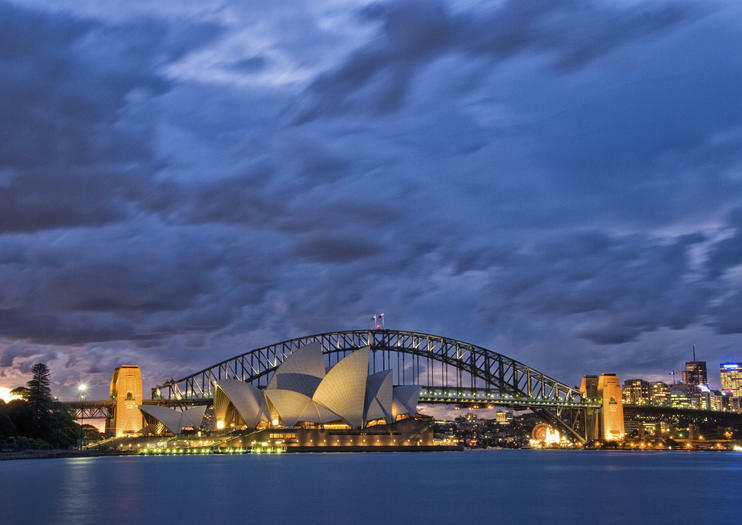 Traveling with a private guide ensures a personalized Sydney experience.